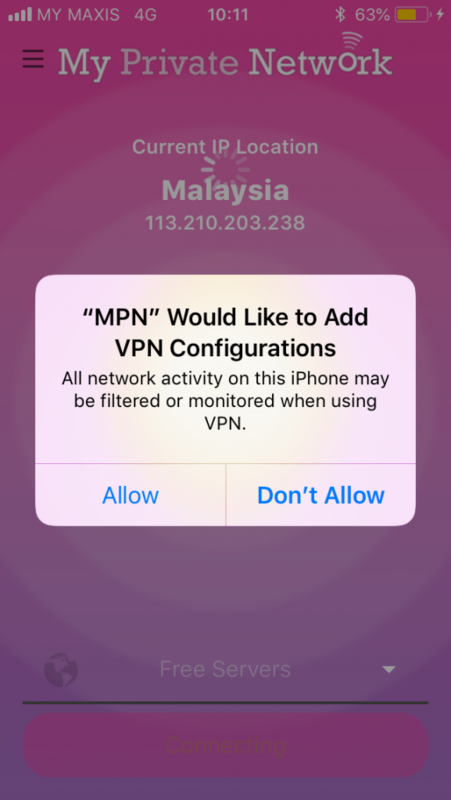 Setting up your Apple iPhone to connect to My Private Network’s VPN should take just a few minutes using our iOS VPN manager app from the Apple App Store. 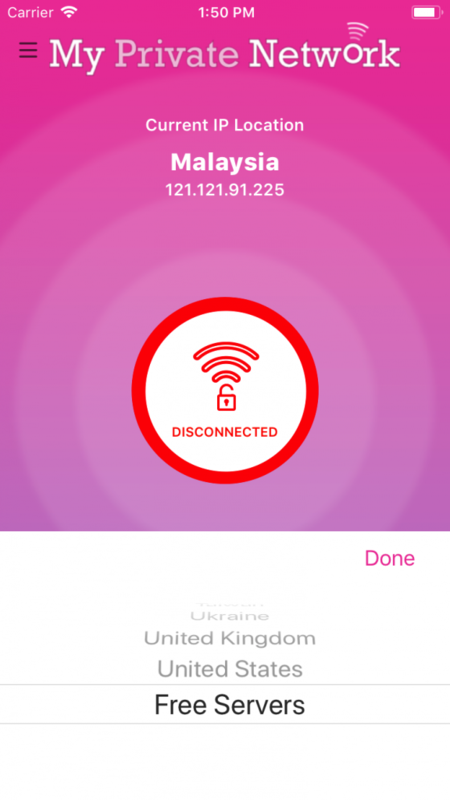 Our app connects to the VPN via the IKEv2 protocol. Please note that your iPhone needs to be connected to the Internet and able to browse the web before moving on with the instructions below. Tap on the Free button to download and install the application. Next, you need to enter the VPN username and password that you used to register with us. Note: If you do not have a registered account with us, tap on Sign Up and register your details to continue. 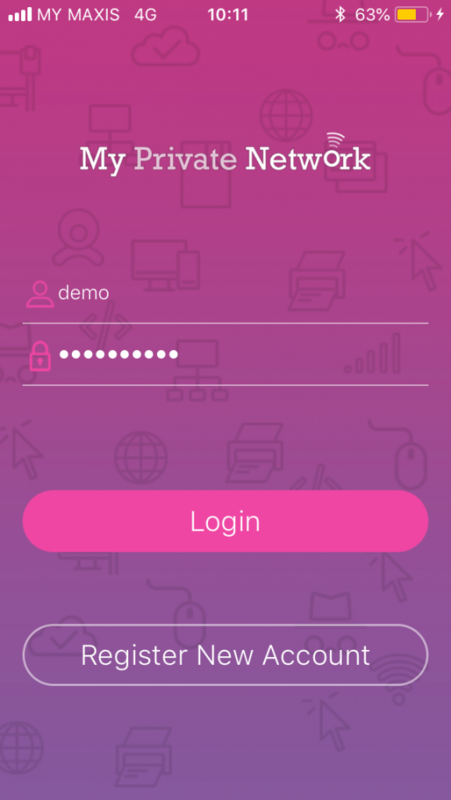 Your login details are automatically saved so you can easily access the app the next time, until you decide to Logout from the app menu options. When you first launch the app and have yet to be connected to the VPN, the middle ring will be red and the padlock unlocked, indicating the VPN is not connected. Select Country: If you are subscribed to our Global Plan, you can tap to choose to connect to any of the listed countries. Once selected, click on Done. 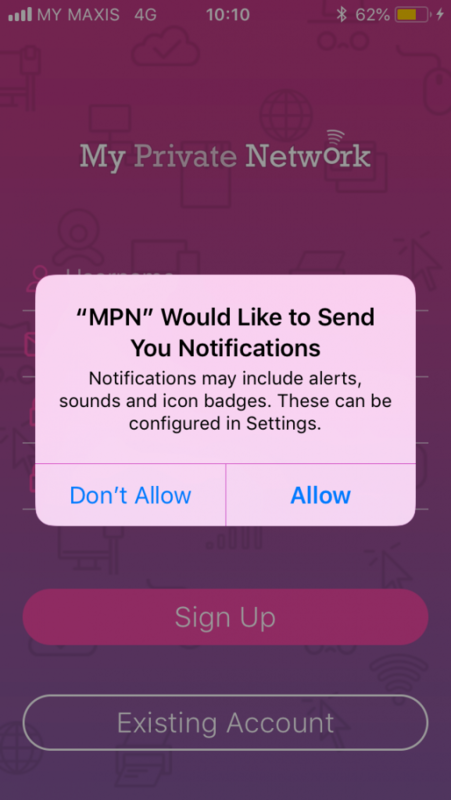 Click Allow to add the VPN configuration to your device and if you receive a prompt stating Connection Failed! during the first connection attempt, don’t be alarmed and just click on Close. Click on Connect again to retry the connection. The middle ring will change to orange and the status and animation will indicate that the app is now attempting to connect to our VPN servers. After a few moment, the middle ring should turn green and the Status states Connected, indicating that you have connected successfully to our service. Also, the padlock will be locked and you should see a VPN logo on the top right hand corner of your iPhone. To disconnect the VPN, simply open the App again and tap on the Disconnect button. The middle ring will turn red again and your IP Location will revert to your original network IP address and Country. The padlock will be unlocked again and the VPN logo should disappear from the top right hand corner, indicating that the VPN is now disconnected. 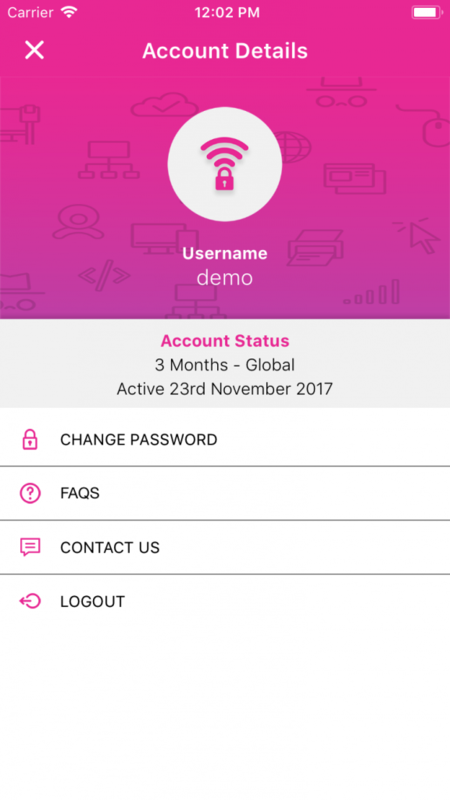 To view the account details that was used to log in to the app, tap on the Menu icon at the top left hand corner of the app. If you have general queries or service issues in relation to the VPN app, you can click on the FAQS (frequently asked questions) option or contact us directly within the app using the Contact Us option.